Heavy Metal will be in full force in Erie, when Tyrant, The Cult Ov Crowley, Perdition, and Obelus come to Scotty's Martini Lounge. Since forming in 2011 in Lansing, Michigan, Tyrant (not to be confused with the German band of the same name, or xTYRANTx, also from Michigan) have released one demo and two EPs over the years, and finally released their debut full-length album, The Pact, on November 23 of this year on Exmortis Records. The Pact is jam-packed with the New Wave of British Heavy Metal (NWOBHM) style, complete with wailing vocals, lightning fast riffing, and the occasional ominous breakdown. The Cult Ov Crowley (yes, it's spelled that way, for you Hermetic Order of the Golden Dawn fans) keep their songs on the dark, brooding, psychedelic side. 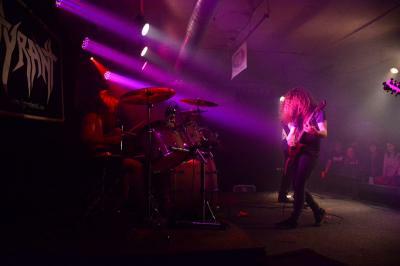 Fans of Black Sabbath, Ghost, and the occult will find common ground with this Akron-based band.